Life is a series of lessons. People with intellectual curiosity and above-average powers of observation contemplate those lessons and endeavor to use them to make sense of the whirling kaleidoscope of existence. These are the sages and the tribal elders. Aging brings with it the realization that life may soon end. Sometimes, to our great good fortune, these observers attempt to share their insights and perceptions with the rest of us. If they succeed, we are enriched. If they miss the mark, well, at least they tried. Hollywood film director Tom Shadyac (Liar, Liar; The Nutty Professor; Ace Ventura: Pet Detective; and more) has made the attempt. In his case, it was not old age that provoked his generous decision to share his wisdom. Mr. Shadyac was brought into confrontation with his own mortality through a serious concussion caused by a bike accident. When the constant pain and other symptoms finally cleared—a long, slow process in his case—he chose to focus on distilling his thoughts on “What’s wrong with the world?” and “What can we do about it?” It should be mentioned here that the author, in his role as a filmmaker, has also created a documentary film called I Am, in which these questions are posed to a number of our time’s most insightful thinkers. Many, if not most, of Mr. Shadyac’s elucidations are mundane truisms. But this absolutely does not discredit them. Sages often have to tell their audiences that they are about to point out the obvious, point it out, and then tell them the it has been pointed out. After all, we live in a world of sensory overload in which fact and opinion; news and soap commercials all battle for space in our brains. The presentation of simple truths can become important documents. Think, for example of Khalil Gibran’s short tome, The Prophet. That book is crammed with commonplace thoughts flowing forth on a stream of poetry. Therein hangs the tale. Author Shadyac seems to eschew the tasty language of literature. He presents his conventional thoughts in conventional prose. Books like his are frequently read by people who already understand the messages contained but desire booster shots of energizing inspirations. Preaching to the choir is not a bad thing, but the preacher has to do something more to keep the choir awake. Mr. Shadyac has chosen the format of Socratic dialogues to tell his story. Dialogues and debates can be exciting. Good verbal pugilism can keep readers on the edges of their seats. Yet these sparring matches seem fixed. Fear and Truth duke it out in what appears more like a puppet show than a real bout. The author’s bias is palpable in every exchange. He tells us that there are no predetermined good and bad judgments to be applied to either of the opponents. He then puts all the smart lines in the mouth of Truth and lets straw man Fear get kicked around the ring in every round. Tom Shadyac’s view of what we need to keep our world from continuing on its downward spiral would have carried more gravitas he had said it better and with more convincing clarity. It would, indeed, be helpful if a how-to book for existence were available. 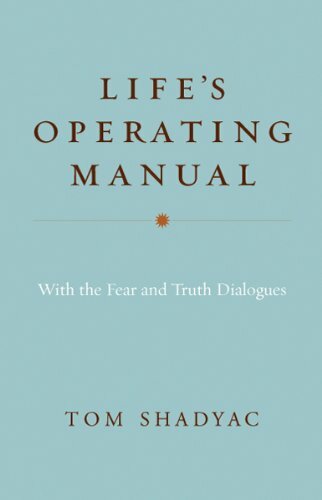 Unfortunately, Life’s Operating Manual is not the book to dispense to the caretakers of all the new arrivals at your local maternity ward.